There’s been a July boost in export sales for Cumbria furniture shop John Young Furnishings in Keswick, all thanks to visitors from South Korea who love British manufactured goods and Miss Potter. The furniture and furnishings shop enjoys a prime location in the centre of Keswick and attracts tourists from all over the world, but this is the first time an order has been sent to South Korea. It was the favourable exchange rate, combined with Britain’s reputation for crafting quality furniture and upholstery that excited the visitors who were also big fans of Beatrix Potter. John Young Furnishings specialises in the best of British manufacture, working with British Craftsmen who produce furniture and upholstery for display and to order. The South Korean family who were staying in the south Lakes, chose a motorised recliner chair covered in dramatic burnt orange British wool, Abraham Moon fabric, and then added accessories including cushions and throws from other British manufacturers and suppliers. One of their favourite choices was a large Beatrix Potter Tapestry wall hanging picked to co-ordinate with their chair. 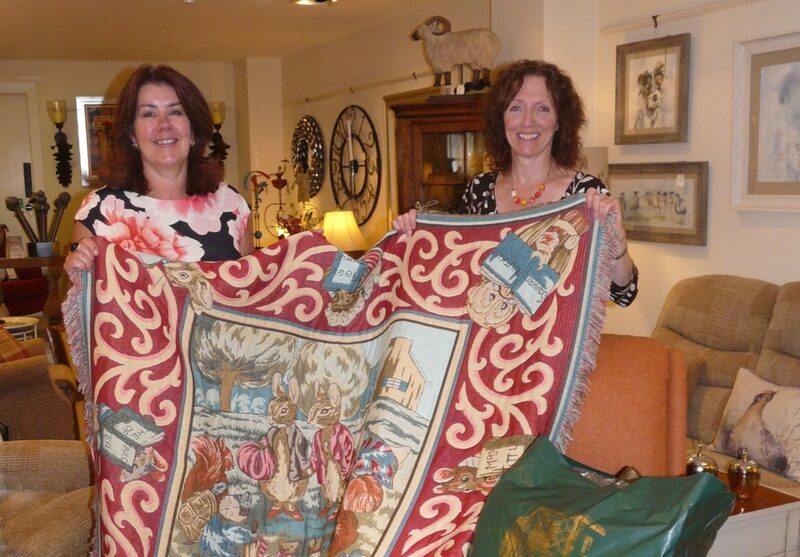 Elizabeth Weightman, manager of the shop said “The 150th anniversary of Beatrix Potter is a real boo st for Cumbria tourism and retail at a time when the county needs it most, so we’re pleased to see our Beatrix Potter tapestry enticing visitors into the shop. Our South Korean customers are eagerly anticipating the arrival of their order which will create a corner of England in their home. John Young Furnishings has been a household name on the Keswick high street for over 125 years – a family business for four generations. Priding itself on customer service and British manufactured goods, it is the type of shop overseas visitors love to explore.